Discover the secret to getting along with anyone! Take a free personality test, discover your personality type, invite your partner or friends and discover easy ways to boost your relationship! 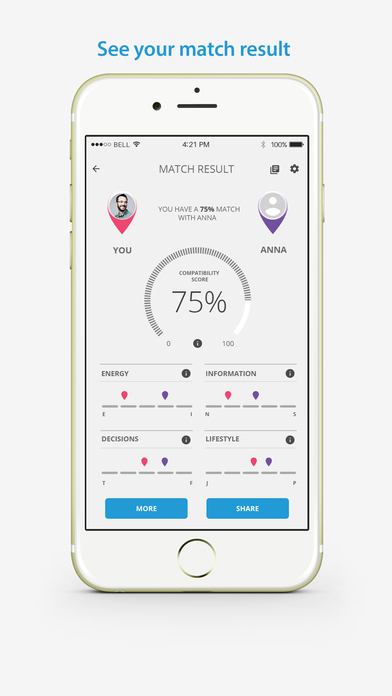 You take the app’s free personality test then invite your partner or friend to do the same. The app then compares both personality types and gives you a compatibility score. It also reveals areas where you get along, and why, as well as listing possible conflict points and how to resolve them. What sets PersonalityMatch apart, is its unique sharing capability. This lets you invite others to take the test and then compares results to produce a compatibility score from 0% to 100%! * Based on the classic 16 personalities psychological tests by Katharine Cook Briggs, Isabel Briggs Myers and the theories of the psychologist Carl Jung. PersonalityMatch is also a great tool for finding your ultimate career path! The built-in personality test works as a career test or job test too. Just take the test, find your personality type and then discover the best and worst careers for your type! 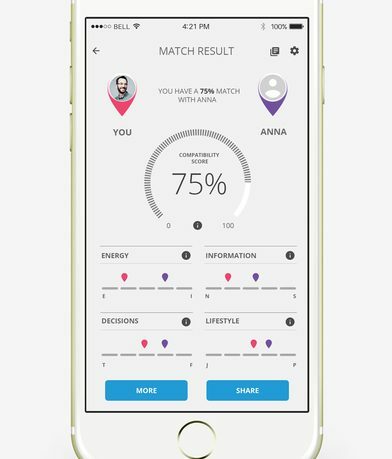 The PersonalityMatch app makes it easy for anyone to identify their personality traits and compare compatibility with people and even prospective careers. To get started, sign-up for an account with an email address or Facebook login. Once logged in, you can take the free personality test. Just answer a few questions on the quiz and find out what personality type you are; The Visionary, The Thinker, The Giver, etc. There are 16 different personality profiles you could possibly be assigned. After completing, invite friends through Facebook, Whatsapp, text message or email to compare your results with your friends. They will need to download the app and take the free quiz of course to match results. Once a friend has added you, you will receive a notification and you can click on the arrows by your friend’s name to get your matching results. Your match result will include a total percentage for your personality compatibility. The free match info includes a break down of characteristics and how your personalities compare. You can then share the result to Facebook, Twitter, or share the link. Encouraged by your match but want more information? PersonalityMatch will go into more depth in comparison by unlocking the particular match result for an in-app purchase of $1.99. A purchase of $4.99 will upgrade the app with unlimited match results. Less interested in people matching and more into what career would be perfect for you? PersonalityMatch will also unlock your career path with insight into your personality’s optimal career choices with positive and negative work habits. This feature can be added for only $2.99. 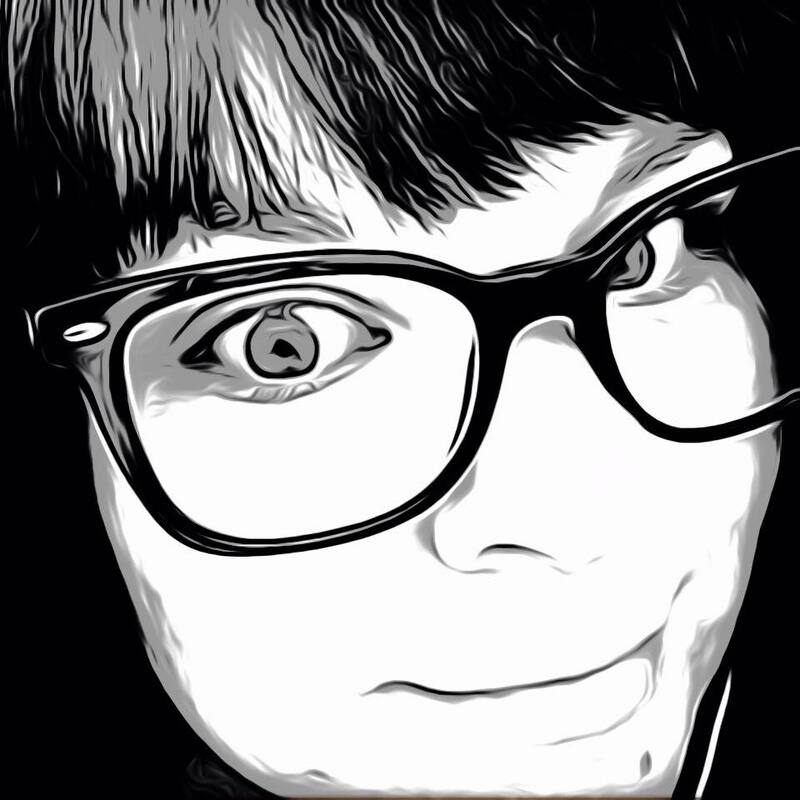 PersonalityMatch does a bulk of its analysis for free, but has some great features included that can be accessed for a nominal fee. It is easy to use and a very insightful application. It would sure to be helpful in many situations, socially or professionally.The app is currently in the App Store for free. It is also available in the Google Play store here. For more information, check out their website, www.personalityperfect.com.